Is Relx PLC (RELX) A Good Stock To Buy? Is Relx PLC (NYSE:RELX) a good investment right now? We check hedge fund and billionaire investor sentiment before delving into hours of research. Hedge funds spend millions of dollars on Ivy League graduates, expert networks, and get tips from investment bankers and industry insiders. Sure they sometimes fail miserably but historically their consensus stock picks outperformed the market after adjusting for known risk factors. Relx PLC (NYSE:RELX) shares haven’t seen a lot of action during the third quarter. Overall, hedge fund sentiment was unchanged. The stock was in 5 hedge funds’ portfolios at the end of December. The level and the change in hedge fund popularity aren’t the only variables you need to analyze to decipher hedge funds’ perspectives. A stock may witness a boost in popularity but it may still be less popular than similarly priced stocks. That’s why at the end of this article we will examine companies such as Marsh & McLennan Companies, Inc. (NYSE:MMC), Phillips 66 (NYSE:PSX), and Kimberly Clark Corporation (NYSE:KMB) to gather more data points. According to most shareholders, hedge funds are assumed to be slow, old financial vehicles of years past. While there are greater than 8000 funds trading at present, We choose to focus on the bigwigs of this club, about 750 funds. These investment experts control most of the hedge fund industry’s total capital, and by tailing their finest equity investments, Insider Monkey has unearthed several investment strategies that have historically beaten the broader indices. Insider Monkey’s flagship hedge fund strategy exceeded the S&P 500 index by nearly 5 percentage points annually since its inception in May 2014 through early November 2018. We were able to generate large returns even by identifying short candidates. Our portfolio of short stocks lost 27.5% since February 2017 (through March 12th) even though the market was up nearly 25% during the same period. We just shared a list of 6 short targets in our latest quarterly update and they are already down an average of 6% in less than a month. 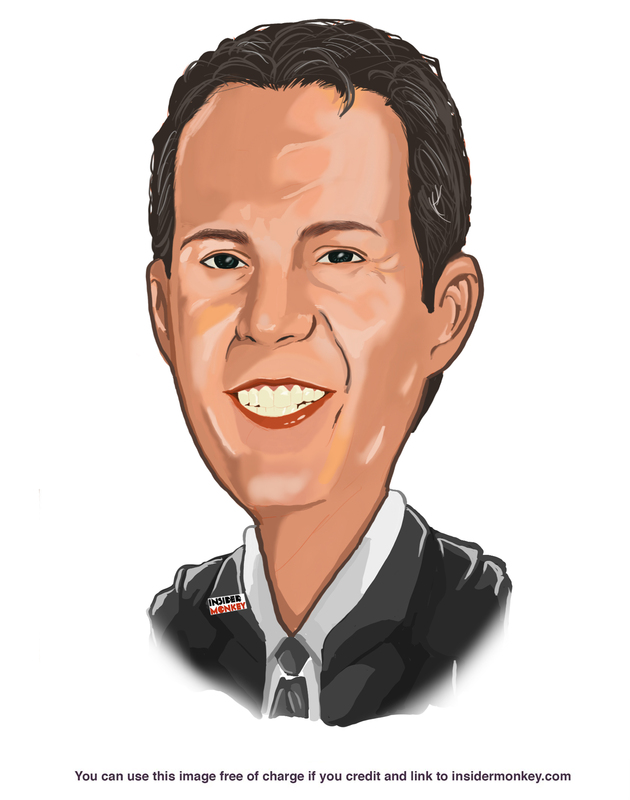 We’re going to take a gander at the recent hedge fund action surrounding Relx PLC (NYSE:RELX). What does the smart money think about Relx PLC (NYSE:RELX)? Heading into the first quarter of 2019, a total of 5 of the hedge funds tracked by Insider Monkey were bullish on this stock, a change of 0% from the previous quarter. On the other hand, there were a total of 6 hedge funds with a bullish position in RELX a year ago. With hedgies’ sentiment swirling, there exists an “upper tier” of noteworthy hedge fund managers who were upping their stakes considerably (or already accumulated large positions). More specifically, Renaissance Technologies was the largest shareholder of Relx PLC (NYSE:RELX), with a stake worth $44.6 million reported as of the end of September. Trailing Renaissance Technologies was Arrowstreet Capital, which amassed a stake valued at $27.7 million. Element Capital Management, Stevens Capital Management, and Citadel Investment Group were also very fond of the stock, giving the stock large weights in their portfolios. Judging by the fact that Relx PLC (NYSE:RELX) has witnessed bearish sentiment from hedge fund managers, it’s safe to say that there exists a select few fund managers who were dropping their full holdings by the end of the third quarter. Intriguingly, Paul Marshall and Ian Wace’s Marshall Wace LLP cut the biggest investment of all the hedgies monitored by Insider Monkey, valued at close to $1.2 million in stock, and David Costen Haley’s HBK Investments was right behind this move, as the fund said goodbye to about $0.5 million worth. These bearish behaviors are important to note, as aggregate hedge fund interest stayed the same (this is a bearish signal in our experience). Let’s check out hedge fund activity in other stocks similar to Relx PLC (NYSE:RELX). These stocks are Marsh & McLennan Companies, Inc. (NYSE:MMC), Phillips 66 (NYSE:PSX), Kimberly Clark Corporation (NYSE:KMB), and Humana Inc (NYSE:HUM). This group of stocks’ market values are closest to RELX’s market value. As you can see these stocks had an average of 39.75 hedge funds with bullish positions and the average amount invested in these stocks was $1620 million. That figure was $74 million in RELX’s case. Phillips 66 (NYSE:PSX) is the most popular stock in this table. On the other hand Marsh & McLennan Companies, Inc. (NYSE:MMC) is the least popular one with only 29 bullish hedge fund positions. Compared to these stocks Relx PLC (NYSE:RELX) is even less popular than MMC. 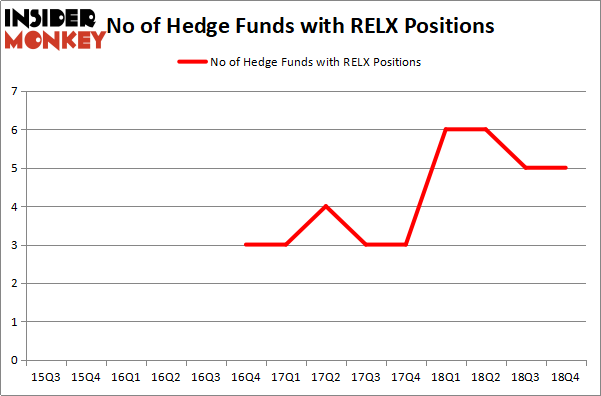 Hedge funds don’t consider RELX as an attractive investment opportunity. Our calculations showed that top 15 most popular stocks among hedge funds returned 19.7% through March 15th and outperformed the S&P 500 ETF (SPY) by 6.6 percentage points. Unfortunately RELX wasn’t in this group. A few hedge funds that bet on RELX were disappointed as the stock returned 8.1% and underperformed the market. If you are interested in investing in large cap stocks, you should check out the top 15 hedge fund stocks as 13 of these outperformed the market. Is Vertex Pharmaceuticals Incorporated (VRTX) A Good Stock To Buy? Were Hedge Funds Right About Dumping FedEx Corporation (FDX)? Were Hedge Funds Right About Selling Northrop Grumman Corporation (NOC)? Is Illinois Tool Works Inc. (ITW) A Good Stock To Buy? Were Hedge Funds Right About Getting Into Bank of Montreal (BMO)? Were Hedge Funds Right About Ecolab Inc. (ECL)?